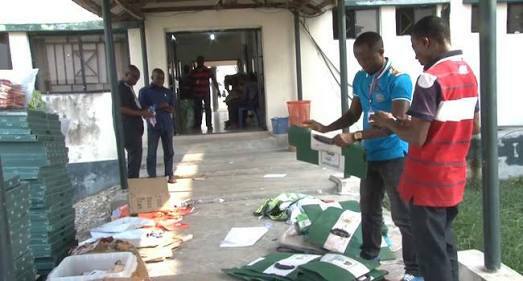 Lagos State Commissioner of Police, Imohimi Edgal and some detectives from the command on Monday stormed a printing press at Gbagada area of Lagos where electoral materials are being printed. It was gathered that the printing press located at No. 13 A and 13 B Oguntano Street, Gbagada, was allegedly owned by one Eniola Fayose. It was also learnt that the owner who hails from Ikere in Ekiti state was not around when police stormed the place. The Ekiti State Gubernatorial election is scheduled to hold this Saturday, July 14, 2018. As at press time, the company's Admin/Human Resources Manager and graphic artist are being quizzed by detectives at the Command Headquarters in Ikeja. The State Police boss who briefed the media at the end of the raid said that on July 8, 2018, an intelligence report from a credible source was received by the command that fake ballot papers meant for the forthcoming Gubernatorial elections in Ekiti state are being printed in a company known as O'Naphtali Limited located on 13B Oguntona crescent, Gbagada, Lagos. He said: "The report further revealed that some of the printed ballot papers were moved to Ekiti state in three Hilux vans on Friday July 6, 2018, while the art works are still in their graphic computers. "Based on the report, the Commissioner of Police, Lagos State Police Command immediately led a contingent of policemen to the location to verify the information. At the scene, it was discovered that the company has two buildings located at number 13 A and 13B Oguntona street, Gbagada phase 1, Lagos. It was also discovered that the two buildings are being used for general printing/art work." "One HP laptop, one Acer laptop, one Booklet of form EC/ EK 8B Ekiti State Independent Electoral Commission EKSIEC; three EKEC 50 A envelop for miscellaneous materials, two pieces of Ekiti SEC, eight A(1) statement of result, one copy of form Ekiti SEC eight A(1), one income tax clearance certificate of Ekiti state, seven pieces of Ekiti state Internal revenue motor receipts, one piece of form EC 8A of Ekiti SEC, one piece of Ekiti State Voters card register log book cover for Ado local government, one piece of NECO mark/attendance sheet, Ekiti State Ministry of Education progress report for secondary school and one colour turn flash drive," he added. He said that the recovered laptops are being scrutinized by the police ICT experts with a view to discovering any incriminating information. "Meanwhile, the Admin/Human Resources Manager and Graphics artist of the company are assisting the Police in the investigation. “Further development will be communicated to the public in due course" he said.